This week saw iCS take part in a golf event, hosted at the Meon Valley Marriot Hotel and Country Club in Hampshire, which has two renowned golf courses. 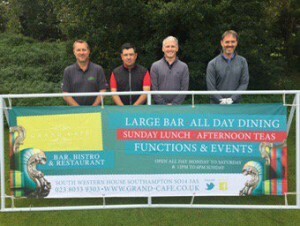 The golf day was hosted by Grand Café part of the Delicious Dining Group, on Tuesday 26th September. Peter Cooper Motor Group kindly invited iCS to enter a team. iCS asked Guy Wright and Warwick Everett from Freestyle IT to join the team of players. The day started at 9am with some mouth-watering bacon rolls at the Marriot Hotel. A shotgun start followed at 10am. The weather was thankfully dry and not too warm. The iCS/Freestyle IT team started on the 12th tee which is a short par 3. The scoring system used was Stableford, with the best two scores from four to count on all the par-four holes and par-five holes with all four scores to count on the par-three holes. This format is used to keep up the pace of play and is both challenging and competitive. The beautiful Championship Course winds its way between lakes, streams and wooded areas with a varied selection of long and short holes. It is in part fairly challenging, which added to the spirit of the occasion. It was a great game and the team worked well together, encouraging each other with their shots. The standard of the golf across the whole event was first-rate. The iCS/Freestyle IT team finished the whole round with a commendable 85 points, just marginally behind the winning team who scored a total of 88 points. The day was nicely rounded off with an evening presentation at the Grand Café restaurant in Southampton. The players all enjoyed an excellent three course dinner and the prize giving. Our team accumulated a high number of points to keep the winners on their toes and despite a few ups and downs along the course ended only a touch outside of the prizes. This hasn’t dampened our enthusiasm and we hope to play again soon.